The Best of Dinosaur Comics 2003-2005 AD (subtitle: Your Whole Family is Made Out of Meat!) is a collection of a webcomic strips that by any reasonable analysis really should never have gotten to the point of having enough strips to be collected. Author Ryan North basically took six panels of generic dinosaur clip art and just changed the words to make a new comics every weekday. Not the pictures, just the words. Then he just writes words. What’s amazing: he’s been doing this since 2003. What’s even more amazing than THAT is that Dinosaur Comics is totally, inexplicably awesome. You should at least check out a few strips at www.qwantz.com. The strip features just three dinosaurs plus the occasional off-panel character like God or The Devil. The strip’s star is T-Rex, who is a force of pure id in that he’s constantly amazed by his own awesomeness, utterly enthusiastic about everything that involves him, and oblivious to the implications of his hijinks. Yet you can’t help liking T-Rex –even loving him– because while he’s a bit narcissistic, his zest for everything that crosses his fever-dream of a consciousness is contagious. He’s a bit like a more thoughtful and intelligent Homer Simpson. 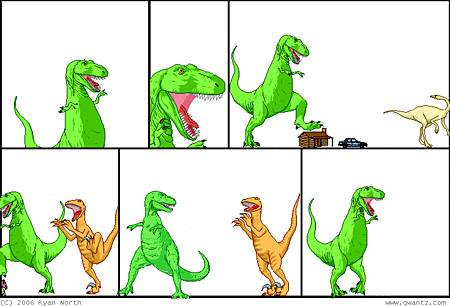 In one strip T-Rex may be expressing his irrational fear of cephalopods or how much he enjoys stomping on things, but in others he may be discussing philosophy, the etymology of obscure phrases, or novel applications of fields like economics, statistics, or literary criticism to problems your non-dinosaur brain never thought of. T-Rex is joined by Dromiceiomimus and Utahraptor, who often act as his foils, but who just as often go along with his debates, discussions, and proclamations simply because doing so makes life more fun. You get the feeling that North is a really smart guy whose interests are far flung, and he is somehow able to use these six panels of clip art to talk about whatever thoughts happen to cross his mind. The strip is blessedly bereft of your typical pop culture or subculture references, instead opting to create its own weird amalgam of quasi-intellectual absurdity. The fact that North has been able to do so for so long and to make it so consistently entertaining is really astounding. Go to www.qwantz.com to see examples of what I’m talking about.